See also: Battle of Guilford Courthouse (from the NC Office of Archives & History); New Garden, Battle of. 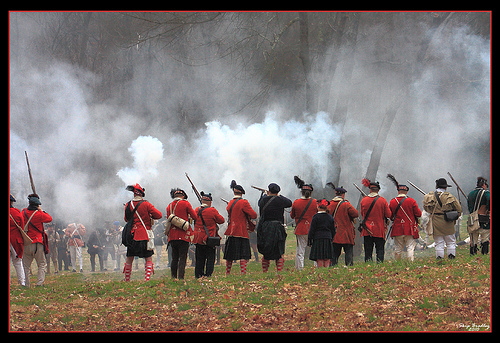 The Battle of Guilford Courthouse, a decisive engagement of the Revolutionary War that took place north of Greensboro on the afternoon of 15 Mar. 1781, pitted the Patriot forces of Gen. Nathanael Greene against Lord Charles Cornwallis's British army. After 1779 the British military strategy had centered on conquering the South and restoring royal authority, then attempting to take control of the North. Prior to Guilford Courthouse, both Greene and Cornwallis had divided their forces in the hope of quick victories, but the Americans had the best of it. They had defeated the British at King's Mountain (7 Oct. 1780) and Cowpens (17 Jan. 1781) through Greene's ingenuity-because his contingent of regulars did not equal Cornwallis's, he avoided typical eighteenth-century battle lines in favor of violent skirmishes and strategic retreats. After Cowpens, Greene began a withdrawal that ranged as far north as Virginia and wore down his British pursuers. Cornwallis burned his baggage train in the interest of speed but never caught Greene. By early March 1781 Greene was ready with a maximum force to meet Cornwallis at a place of his own choosing. The place Greene selected was Guilford Courthouse, located on the main north-south road between Petersburg, Va., and Salisbury, N.C. The site consisted of little more than a few log buildings, but it was the ideal backwoods assembly point for the approximately 4,400 soldiers fighting under Greene. Equally important was the terrain around the courthouse, where, from the south, the road passed through mixed woods and fields before reaching a high clearing surrounded by dense timber. Additionally, Greene knew that there were no nearby bodies of water where his troops might be trapped if they left the battlefield. They could simply disappear into the woods and reassemble at a designated point. This had been Greene's tactic since he assumed the southern command in December 1780. By mid-March 1781, Cornwallis and his approximately 2,000 well-trained, experienced men were a few miles southwest of the courthouse at Deep River Friends Meetinghouse, where he was informed of the growing force of Americans there. In the words of one historian, Cornwallis accepted Greene's "invitation" to battle. Put another way, the British fell for his trap. To strike at the largest American force in the South, Cornwallis had to move his men up New Garden Road and eventually to the clearing and up the incline at the courthouse. Greene followed a simple plan of positioning his troops in three lines, with the first line held by militia from North Carolina, reinforced with sharpshooters. They were expected to get off two or three rounds before retreating. A second line of Virginia militia reinforced with small field pieces was expected to perform in the same manner. Greene reserved his experienced 1,500 Continental regulars for the third line. By the time the remaining British met them, he hoped, they would be heavily depleted. The attack began in the early afternoon of 15 March. The British force broke through the first and second lines relatively quickly but suffered many casualties. The iron discipline of the British army kept Cornwallis's men moving forward despite their losses and the difficult terrain between the second and third lines. After inflicting further damage to the enemy, Greene withdrew his troops. The British held the field and could claim victory, but in reality the Americans had prevailed: Cornwallis had lost nearly one-quarter of his forces to death or injury, whereas Greene had suffered fewer casualties and left the battle with his vital units of regulars practically unscathed. Shortly afterward the American army began to reassemble 15 miles away at Troublesome Creek. Although Greene was initially disappointed with his troops' performance, it soon became apparent that they had done irreparable damage to Cornwallis's army. He slowly withdrew to Wilmington to refit and, after a period of rest, carried out a reconquest of the Carolinas using hard-hitting guerrilla tactics. Cornwallis retreated to safety, searching for supplies and a way to mend his shattered force. Cornwallis's so-called victory in the Battle of Guilford Courthouse was derided in England, where Charles James Fox told the House of Commons that "another such victory would ruin the British Army." The accuracy of his observation was borne out before the end of the year. Cornwallis, still intending to conquer the South, shifted to Virginia, where another American force was assembling. At Yorktown, seven months later, Cornwallis surrendered to Gen. George Washington. Thus, while technically an American defeat, the brief struggle at Guilford Courthouse proved to be a strategic victory for the Americans. After years of neglect, the Guilford Courthouse Battleground Company was established in Greensboro in 1887 by former superior court judge David Schenck and his associates to preserve the site of this key Revolutionary War battle. Shortly after arriving in Greensboro in 1881, Schenck examined the area and found little to indicate the intense struggle that had taken place on the afternoon of 15 Mar. 1781. Few citizens seemed to know anything about the battle. In October 1886 he wrote in his diary that he was going to "save the battlefield." The Battleground Company was formed and granted a state charter on 7 Mar. 1887 to preserve the site and erect "monuments, tombstones, and other memorials to commemorate the heroic deeds of the American patriots who participated in this battle for liberty and independence." In the 30 years of its existence, the Battleground Company erected 27 monuments, cleared miles of grounds and trails, and achieved Schenck's goal of preserving the battlefield site. The privately owned and operated park at Guilford Courthouse was one of the earliest efforts to preserve a Revolutionary War site in the United States. In 1917 the federal government assumed control of the site, which became the Guilford Courthouse National Military Park. Located about six miles north of downtown Greensboro, the park features a visitors center, completed in 1976, that includes artifacts, an audiovisual presentation, and publications for sale. Thomas E. Baker, Another Such Victory: The Story of the American Defeat at Guilford Courthouse That Helped Win the War for Independence (1981). Baker, The Monuments at Guilford Courthouse National Military Park (1980). Guilford Courthouse Battle, taken at the Couthouse Square, Greensboro, March, 2010. Photo uploaded from Flickr user Skip Bradley. Available from http://www.flickr.com/photos/skipbradley/4434974578/ (accessed May 11, 2012).